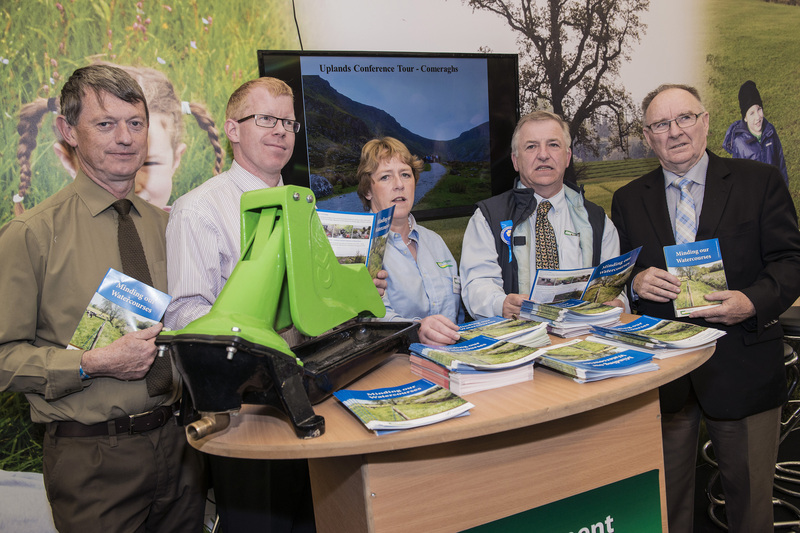 Pictured at the launch of the Teagasc/ Inland Fisheries Ireland booklet on ‘Minding Our Watercourses’ on the Teagasc stand at the National Ploughing Championships in Ratheniska, Co Laois are Greg Forde, Inland Fisheries Ireland, Dr Ciaran Byrne, CEO Inland Fisheries Ireland, Catherine Keena, Countryside Management Specialist, Teagasc, Prof. Gerry Boyle, Director Teagasc & Brendan O’Mahony, Chairman, Inland Fisheries Ireland. A new leaflet “Minding our Watercourses” jointly produced by Teagasc and Inland Fisheries was launched this week. It emphasised that proper management of farm watercourses, whether large rivers or small streams, is critical to ensuring high levels of biodiversity. Dr Ciaran Byrne, CEO of Inland Fisheries Ireland acknowledged the important role of farmers in the management of watercourses and commented: “Smaller streams, even where no fish are apparent, are critical to the biodiversity of the catchment”. There are twenty-nine species of freshwater fish found in Irish freshwater with fourteen native species present since the last Ice Age. The leaflet shows there are different places for different species and life stages within watercourses: salmon and trout spawn on gravels in winter; lamprey spawn on gravels in late spring and summer; coarse fish lay their eggs in weedy parts of the channel; salmon and trout use riffles in the first year and move to deeper water as they grow larger; and juvenile lamprey live buried in silty margins of watercourses. The new leaflet “Minding our Watercourses” details best practice management of watercourses. Fencing and providing an alternative source of water is recommended as this avoids damage to the river bank and bed, reduces siltation, prevents fouling with pathogens and prevents the escape of nitrogen and phosphate. Allowing native trees to grow along watercourses stabilises banks, creates a natural buffer zone, provides valuable habitat for flora and fauna, controls in-stream temperature and weed growth and provides shade and shelter for livestock. Buffer strips alongside watercourses intercept silt, nutrients and improve bank stability. Farmers are reminded to watch out for and report invasive plant species which smother out smaller native species, which die back to leave large bare areas in winter, resulting in soil erosion. Fish and their spawning grounds are protected under the Fisheries Acts (1959-2010). In-stream works should not be carried out without prior consultation and the approval of Inland Fisheries Ireland. If maintaining watercourses, the advice is: not to disturb the non-working bank slope; retain vegetation at the water’s edge; leave the working bank slope intact; remove vegetation and silt material from the open channel only; not to remove stone or gravel place spoil along the bank outside the bank-full line, spreading thinly; and leave a buffer of twenty metres at the downside end of a drain to act as a silt trap.